Meanwhile, Carlos Rodriguez, of the Polartec-Kometa junior team, finished 6th in Paris-Roubaix Espoirs. Carlos Rodriguez was in the U19 (junior race, not espoirs), but a very nice race by him, he was also good in GW 2 weeks ago (14th) + did very well in some Spanish races where he basically was best 1st year junior in all races. From what I have seen of him in the u17 category I think he is a very versatile rider, but this is impressive as a 1st year junior from Spain (they dont normally perform that well in U19 cat) and as I think Rodriguez is suited much better to different races. Guess he also made his decision as he was doing Road Racing, BMX and Sailing at a high level last year. You're right I typed that without thinking For such a young rider his performances have been amazing. I am wondering if he will ride for a Belgian team next year, if I recall correctly there was some sort of 'exchange program' between the Fundacion Contador team and some Belgian youth teams a couple years ago which saw some Spanish riders race (part of) a season in Belgium. It was with Tieltse Rennerclub, but I dont think they still do that, though I am not sure. From June 1st, Juan Pedro Lopez will join the continental team after an impressive start of the season in the U23 ranks. John Stiven Ramírez, a former mountain biker, will join the U23 team. Another Colombian for Bert. DNP-Old wrote: John Stiven Ramírez, a former mountain biker, will join the U23 team. Another Colombian for Bert. I guess with Juanpe Lopez moving up to the continental team, there is a free spot available. Jhon Gutiérrez, one of the sponsors of Fundacion has interests in Colombia, so it is likely we'll see more in the team in the future. I like it. Cool kit, but why does Moschetti get a kit in his national colors but not Canton, while both are U23 champions of their country as far as I can see? maybe that is why poor Isaac looks a little lost in thought. 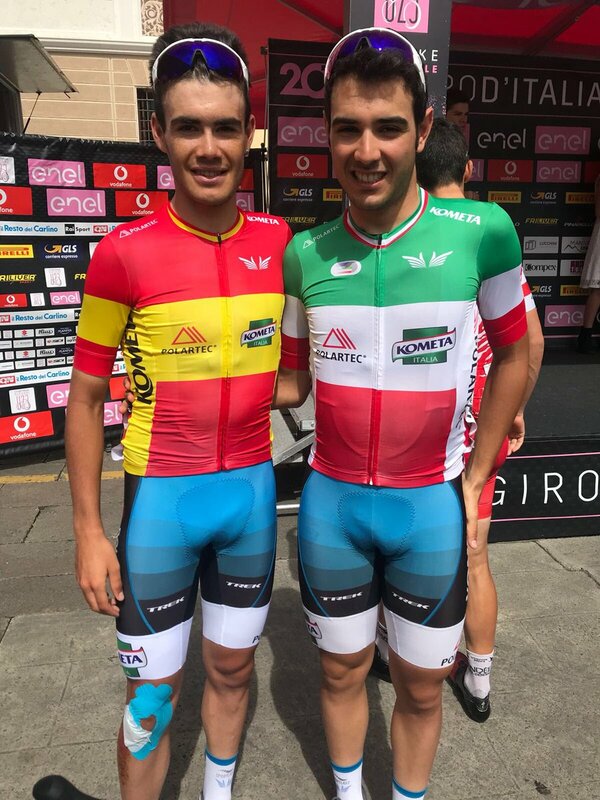 As far as i know Moschetti got his jersey mainly for the U23 Giro, they want to emphasisethe fact that he's riding the race as the Italian u23 NC. These are our 6 aces for the Baby Giro. Lots of climbing in this race, a prologue and a final TT - with a very interesting format, the riders will start according to their GC gaps, no drafting allowed. First to the finish is the overall victor. We are of course going to be looking for Moschetti in the sprints, and I think Michel Ries should be the best rider in the mountains, considering the form he showed recently in Tour de l'Ain. Juanpe Lopez is being thrown in at the deep end, expectations for him shouldn't be too high. Personally I would have liked to see Awet Habtom here as in my eyes he is one of the strongest climbers on the team. 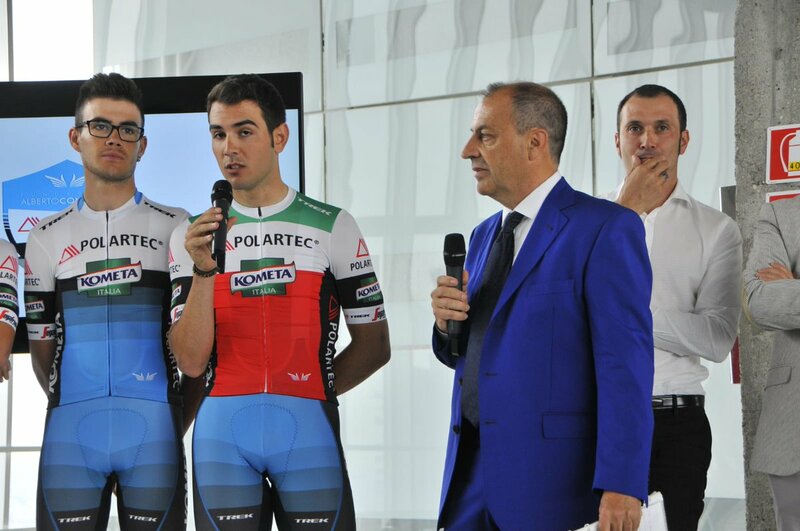 LaFlorecita wrote: These are our 6 aces for the Baby Giro. Lots of climbing in this race, a prologue and a final TT - with a very interesting format, the riders will start according to their GC gaps, no drafting allowed. First to the finish is the overall victor. I thought the same about Habtom, but then I saw that he DNF the Tour de l'Ain, maybe he crashed/has some health problems? These are the results for the prologue, all guys nicely inside the top60, although I can't find Diego Sevilla's time anywhere. Obviously a good result for Moschetti, I expected maybe a little more from Gamper and Canton, but maybe it was too short for them. Ries limited the damage with his GC options in mind. Nice time also for Lopez in his first race for the team. Last edited by LaFlorecita on 08 Jun 2018 15:14, edited 1 time in total. Mayomaniac wrote: I thought the same about Habtom, but then I saw that he DNF the Tour de l'Ain, maybe he crashed/has some health problems? I don't know anything about that, but I kinda hope it's something like that, and not visa troubles again. Moschetti 10th today. I'm surprised he was still in the group, that finale looked quite hard on paper. Michel Ries finished 19th, also in the big group. Canton got a special jersey for the 2nd half of the Baby Giro as well. 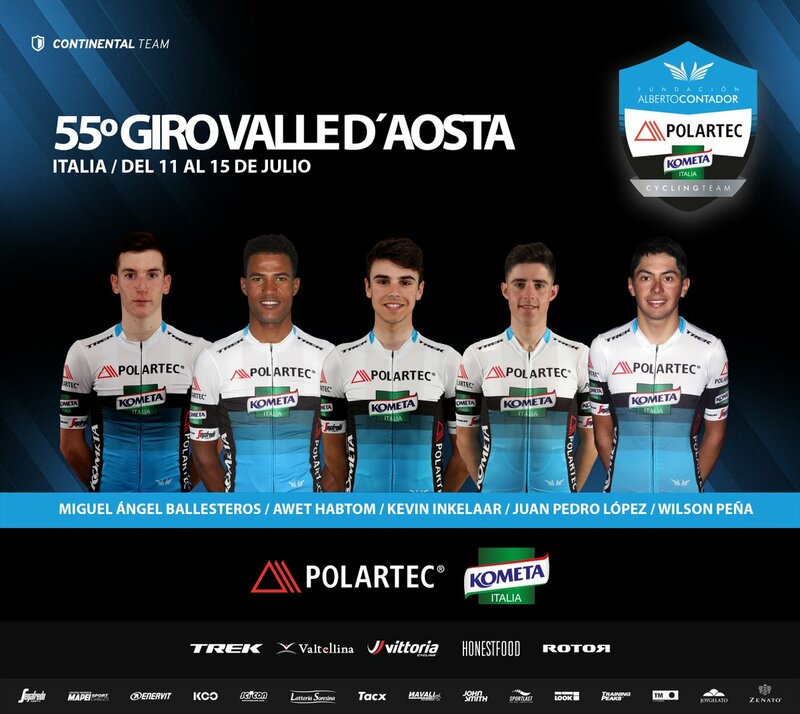 The team for Giro Valle d'Aosta. All eyes on Habtom although Inkelaar looked good in this race last year. Pretty great result for the team in the uphill prologue in Giro Valle d'Aosta. Juanpe Lopez, who only moved up to the pro Conti team in June, finishes 5th, and Wilson Peña is 10th!